Etna (Sicily, Italy): After gradually increasing the already mentioned strombolian activity from Voragine during the evening of 2 Dec, it escalated into a short, but very violent phase of lava fountaining (paroxysm), with high lava fountains and an eruption column several kilometers high. The strombolian activity in the Voragine crater that started about a month ago has today increased its intensity. While until yesterday the explosions were too small to reach the top of the crater rim, now they are large enough to be seen from the various Etna webcams. Due to poor visibility the glow from Voragine was incorrectly attributed to the New SE crater earlier. The New SE crater however did show some weak ash emissions this afternoon. 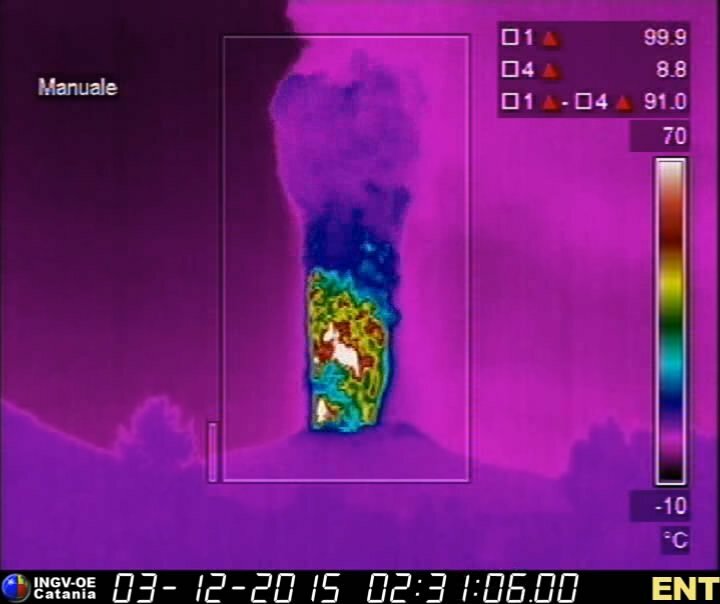 Batu Tara (Sunda Islands, Indonesia): Impressions of strombolian and vulcanian activity from Batu Tara volcano observed during our recent expedition from 23-26 Nov 2015. Erta Ale (Ethiopia): During our recent volcano expedition to the Danakil depression, we have observed the active lava lake of Erta Ale - which had been at very high level just a few meters before overflowing - for three continuous days (19-21 November 2015). with some droplets reaching the outer rim of the vent. Pele´s hair was continuously formed and blown around. Zigzag patterns broke up the lake´s black crust, pushing it to the lake´s edges where they were recycled into the molten lava. Degassing in the form of Strombolian activity and short-lived fountains was sometimes so intense that lava spattering could even be seen from the old caldera ridge where we had our camp.